We L-O-V-E ice cream. About six months ago Sarah asked me if I’d made a chocolate ice cream for Primal Plate’s blog yet. I reminded her that I had, albeit a No-Churn Double Chocolate & Cherry Ice Cream version rather than one made from just pure chocolate. It obviously hadn’t satisfied Sarah’s need because ever since she came back from holidaying in Tuscany (12 years ago! ), she’s been raving about the Italian-style ‘cioccolato gelato’ that she just couldn’t get enough of whilst she was there. As Valentine’s day is just a couple of days away and I’ve heard dark chocolate is literally good for your heart, I thought I’d try and replicate the intensely-flavoured, Italian chocolate ice cream that Sarah still vividly remembers. It was a labour of love. My brief was lots of rich, lingering chocolatey flavour, just the right amount of smoothly soothing creaminess and no sugary aftertaste. It sounds like the perfect combination for a delicious keto dessert, but this one didn’t come easy. Behind scenes, every new recipe I develop for Primal Plate takes at least three to four hours experimentation before I’m satisfied it works and is worthy of posting. To say I’m demoralised when I spend an entire afternoon in the kitchen and a small fortune on ingredients with nothing delicious to show for it, is an understatement. My first attempt at making Tarfuto Gelato (Italian for chocolate truffle ice cream) whilst carefully following a recipe in a well-known cookery book, turned out to be a rock-hard, grainy, under-sweetened, frozen ‘clod’ of inedible ice! Usually, when I’m following someone else’s recipe, I instinctively know when something isn’t going to work and how to put it right, but on this occasion my cook’s intuition had gone ‘bye-byes’. In retrospect, the recipe was so ill-conceived and poorly written, I didn’t stand a chance. Sarah and John are always a little more forgiving of my foodie sorties into the unknown and nobly volunteered to eat the damn stuff, but most of it ended up where it belonged…in the bin. But that wasn’t the end of it. Once chocolate ice cream was on Sarah’s ‘radar’, there was no turning back. Almost defeated, but not quite, I decided that if I was going to succeed in my quest to make The Ultimate Chocolate Ice Cream I’d better go ‘belt and braces’ and buy myself a decent cook’s thermometer. Another sixty-five quid to add to the mounting costs of chocolate ice cream hell! As things turned out, it was a good call. Whilst I waited for my luxury digital-probe thermometer to arrive, I tentatively but radically altered everything I knew was wrong with the previous recipe and in one fell swoop came up with The Ultimate Chocolate Ice Cream. For a health-driven food blogger, nothing feels as good as making healthy sweet! Because what’s more Primal than to seek out the sweet taste of sugar like your forebears did? It’s an instinct that’s hardwired into our DNA. The problem is that sugar is no longer the rare and lucky find that thousands of years ago provided our ancestors with the calories their bodies desperately needed to keep moving and to survive times of famine. Today, sugar is the edible enemy that will mostly likely kill you. Not only have we inherited the sugar-craving gene, it’s thanks to Big Food (along with Big Agri, Big Pharma and the likes of Slimmer’s World) who know exactly how to exploit our biological need for sweet, that there’s now sugar, sugar everywhere in the processed foods they peddle, and lots of overweight and sick people to show for it. Mass-produced ice cream made from milk powder, water, refined sugar, high-fructose corn syrup, artificial flavours, stabilisers, emulsifiers and “substances of plant and synthetic origin” may have the taste and texture of sweetened, aerated cardboard and be a serious health hazard, but at least it’s not a sheep in wolf’s clothing. What really gets my goat is Ben & Jerry’s ‘premium’ ice cream. They’d have you believe that it’s worth paying extra for their all-natural, “Caring Dairy” “Fair trade” environmentally responsible ice cream, but surprise, surprise, they’re not for real. Their reputation has been built on a cynical global marketing ‘game of pretence’ that creates the impression, amongst others, that the milk they source for their ice cream comes from cows that are allowed outside to graze on grass. The truth is that Ben & Jerry’s uses the same milk as most other commercial ice cream manufacturers. It comes from intensive dairy farms where anxious cows are kept in close confinement for their entire (short) lives and fed a diet of soy and grains that their digestive systems simply can’t cope with. Poison ice cream anybody? Ben & Jerry’s Chocolate Therapy ice cream is not what it seems. As well as containing whacky ingredients such as wheat flour, soybean oil, carageenan, guar gum, Dutched cocoa (alkalised to make it taste less bitter) and six teaspoons of refined sugar per 100 grams (Yikes! That’s the maximum recommended daily sugar allowance for women in just one-half cup serving) it also likely comes with its own sundae topping of pesticide! Here’s what the Organic Consumer’s Association (OCA) has to say about their “Roundup-Ready” ice cream. So far as I know, Unilever-owned Ben & Jerry’s still haven’t cleaned up their act and gone organic and for that reason, as they say, I’m out. For me, ’The Most Important Thing’ is to show you how to nourish yourself and the people you love with real food that makes everyone want to do a happy dance. To this end, The Ultimate Chocolate Ice Cream is chock-full of organic ‘superfood’ ingredients - high percentage dark chocolate, pastured egg yolks, full-fat grass-fed milk and cream. I think it goes above and beyond the call of duty to eat well and stay slim. It’s so deliciously indulgent, people who want to lose weight, might think of it as food anarchy! How else do you think Sarah and I maintain a dress size 6? It’s not by restricting what we eat - although when you ‘go keto' you can easily intermittently fast for more than 18 hours without even realising you’ve not eaten - It’s all about never feeling deprived of the things you love to eat. Nothing is more powerful than when you combine care with eating wonderful food. Add to that the emotional response people have to chocolate and ice cream (especially Sarah! ), and it’s probably true to say that nothing speaks the language of love more eloquently than this sublime, home-made, chocolate ice cream. It’s so much more than just food…it’s the sweetness and light of the pleasure principle that our ancestors lived by and that a part of us can never forget. If you're not using ready-made chocolate ‘drops’ (as listed in ingredients above) snap or chop the chocolate into small pieces, then place in a heavy-based saucepan with the milk. Heat gently, stirring until completely smooth. Do not let the mixture boil. Using an electric hand whisk, beat the erythritol and egg yolks together in a heatproof mixing bowl until pale and thick. Heat 5cm of water in a saucepan that your mixing bowl will comfortably sit on top of without allowing any steam to escape at the sides (you don’t want to burn your hand when stirring the custard base!). Add the cooled chocolate mixture to the eggs and erythritol, beat vigorously then set the bowl on top over the top of a pan of barely simmering water, ensuring the bottom of the bowl is not touching the water. Cook the custard, regularly stirring so it doesn’t catch on the base or sides of the bowl until it thickens into a smooth custard that thickly coats a metal spoon (this can take up to 20 minutes). If you’re using a thermometer to check the temperature, it should reach about 85℃ / 185℉. Whatever you do, don’t allow the mixture to boil or it will curdle. Remove the pan from the heat. Sit the base of the mixing bowl in a few inches of cold water until the mixture is completely cold, stirring occasionally. Once cooled, add the vanilla extract and strain through a fine sieve into a clean bowl, then cover and refrigerate. 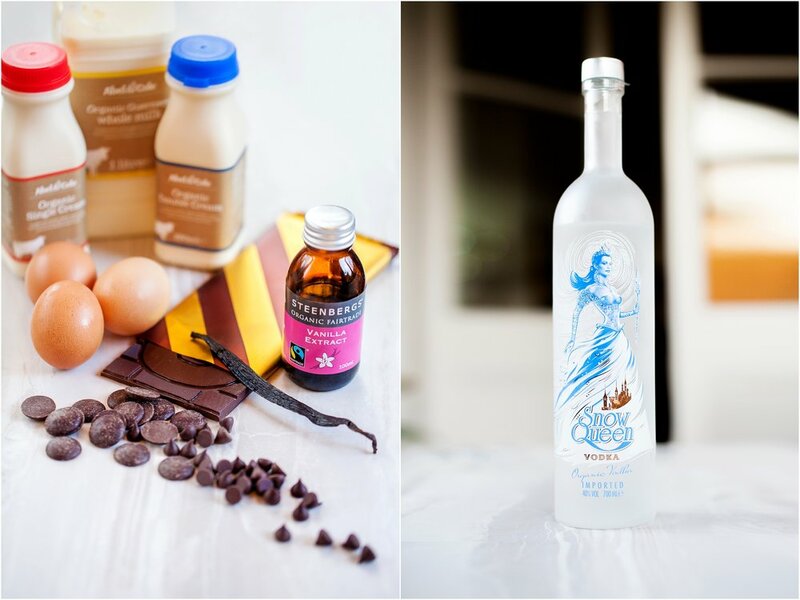 When the mixture is completely chilled, beat the cream and alcohol into the chocolate mixture. Churn in an ice cream machine, according to the manufacturer’s instructions, until it is the consistency of whipped cream (about 20-25 minutes). About 5 minutes before it’s ready, mix in the 40 grams of finely chopped chocolate and continue churning until set. Quickly scrape into a glass freezer-proof box, level the surface and cover with waxed or greaseproof paper and a lid. If frozen solid, take the ice cream out of the freezer about 30 minutes before you intend to serve it to let it soften enough for scooping. I prefer to use a metal mixing bowl to make ice cream because it transfers heat and cold more quickly. You can use a glass bowl but it will take longer to cook and cool your custard. 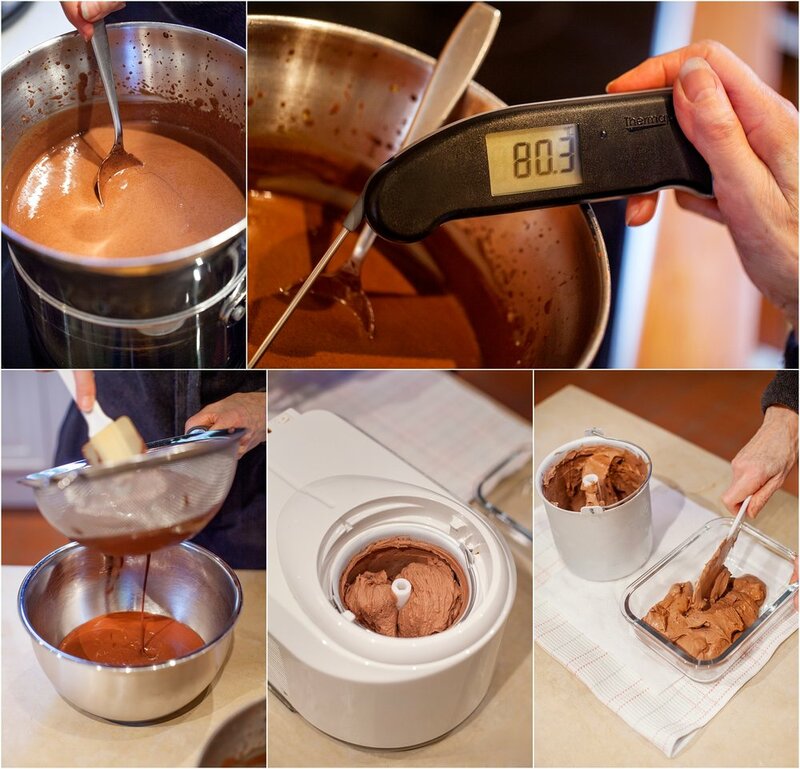 Whilst I recommend you get a cook’s thermometer to make The Ultimate Chocolate Ice Cream, it doesn’t need to be a fancy-pants version like the one I bought. This digital thermometer was my second choice and I think it will serve you just as well. Although I didn’t find Pacari's professional organic chocolate couverture drops in time for this recipe, I’m really tempted to test them out. Perhaps a vegan version of The Ultimate Chocolate Ice Cream made with Pacali’s 85% chocolate drops, coconut milk and cream already beckons! I chose to use organic A2 pasteurised milk for this recipe rather than the raw, organic grass-fed milk we prefer to drink because it has to be heated anyway to make the base custard. If you normally suffer discomfort after consuming regular A1 milk, you might find that you can tolerate A2 milk perfectly well. I’ve recently been channeling my inner child ‘sunshine style’ with gourmet beef burgers and homemade ice cream eaten ‘al fresco’. My only dilemma was which recipe to feature first on Primal Plate’s blog. Given that the hot weather continues unabated, this gorgeous rose and raspberry ice cream, inspired by an English country garden at the height of summer, took priority because in unrelenting heat who doesn’t crave something refreshing to cool down? One mouthful of this sophisticated ice instantly tells you that carbohydrate restriction doesn’t mean giving up the foods that give you most pleasure. Low-Carb Rose & Raspberry Ice Cream’s bright and showy presentation actually made me laugh out loud when I first brought it to the table but what really sets this glamorous ice cream apart is the double-whammy of silky-smooth creaminess from organic cream and Mascarpone cheese. The light, fresh flavour of dairy, intensely sweet-sour flavour of ripe raspberries and subtle floral perfume of rose harmoniously combine with each other to make an especially delicious keto ice cream. If you like eating ice cream and are following a vLCHF (very Low Carbohydrate, Healthy Fat) diet, this beauty comes with a 100% happiness guarantee! Take the raspberries from the freezer half an hour before you start to make the ice cream. Tip them onto a large flat plate and allow them to defrost. Meanwhile, whip the cream lightly until soft peaks just start to form. Set aside and keep cool in the refrigerator. Puree the defrosted raspberries and vodka together in a blender. You can pass the puree through a fine sieve if you don’t like the seeds but I don’t bother. Set aside. In a separate bowl, beat the egg yolks, Sukrin icing sugar, rose extract and finely grated lemon zest until pale and fluffy - takes about 5 minutes using an electric whisk. Whisk in the mascarpone cheese and pureed raspberries, then fold in the whipped cream. Pour into an ice cream maker and freeze until soft-set following the manufacturer’s instructions*. Scrape the soft-set ice cream into a freezer proof container quickly smoothing it out on top. Cover the surface with a layer of waxed paper before sealing with a lid and freezing until solid. *Alternatively, pour the mixture into a container with a lid and place in the freezer. Stir the ice cream every fifteen minutes or so until it firms up - it will take about 1-1.5 hours. Homemade ice cream, especially one made without sugar, tends to go rock solid and the longer it’s left in the freezer the harder it gets. The first time I made a batch of this ice cream I let it set overnight. By the next day it was nigh impossible to scoop and I got so frustrated with waiting for dessert I ended up smashing the glass container it was stored in! Alcohol doesn’t freeze, so I subsequently added a small amount of vodka to the recipe to keep this ice cream the right side of solid without overpowering or altering its original taste. This means it’s an ice cream for adults only. If, like me, you find patience boring please don’t take a hammer and chisel to it! Just remember to take it out of the freezer and keep in a refrigerator for 20-30 minutes before attempting to make the perfect scoop. Using frozen rather than fresh raspberries makes this ice cream trans-seasonal. So pretty and fresh-tasting, I can see myself serving it for dessert on Christmas Day! I’ve taken the zing of lemons to extreme in this sugar-free, light and lovely Fresh Lemon Mousse. In my book, if the clean, fresh, sour essence of lemon doesn’t acidify your tastebuds enough to stimulate a spontaneous squint in one eye, you’ve gone overboard with the sweetener! What I love about this recipe is the contrast between citrussy aromatics and the soft gentleness of a creamy, light-as-air mousse. In fact it is so fluffy and cloud-like, it feels like you’ve inhaled this dessert rather than eaten it! Add to this the satisfying crunch of toasted almonds to further soothe the sharpness of lemon and it’s a positively sublime, melt-in-the-mouth finale to an Easter celebration lunch. Sugar-Free Fresh Lemon Mousse is an unapologetic invitation to ‘scaredy-fat’ members of Weight Watchers, Slimmer’s World and all others still faithfully adhering to outmoded, anti-fat dietary guidelines, to do their research. Here’s a helpful link to get you started. Once you’re persuaded that a low-carb, high-fat (ketogenic) diet can be a more efficient and enjoyable strategy for a healthier, slimmer body than calorie counting and low-fat can ever be, I imagine you’ll be happy to grab yourself a long handled spoon and dive in. After counting calories, syns, food points or whatever else low-fat propagandists have people do, this seductive, Sugar-Free Fresh Lemon Mousse makes for eye-opening, lip-smacking, diet ‘liberation’ that makes the heart sing. What a perfect way to celebrate new beginnings. Grate the zest from the lemons and juice them - you should end up with about 80ml juice and 1 heaped tablespoon of zest. Bring a pan of water to the boil and reduce the heat so that it is barely simmering. To create a stove top bain-marie (double boiler) select a stainless steel mixing bowl to fit on top of the pan without the base of the bowl coming into contact with the water. There should be at least an inch of space between the water and the bottom of the bowl. Now separate the eggs. Place the egg yolks into the bowl you’ve selected for the bain marie and the egg whites into a separate, scrupulously clean, metal bowl. Set the egg whites aside. Add the erythritol and monk fruit powder to the egg yolks and whisk for about 2 minutes until pale and thickened. Stir in the lemon juice, zest and yogurt. Now place the bowl with the egg and lemon mixture on top of the pan of simmering water and whilst whisking constantly, cook the mixture for about 10-15 minutes, until it thickens into lemon curd. It’s ready when it’s the consistency of mayonnaise or hollandaise sauce. Immediately plunge the base of the bowl in cold water and keep stirring the lemon curd until completely cooled. Set aside. In a separate bowl, whisk the cream until soft peaks just start to form, then stir or gently whisk into the lemon curd so it’s evenly combined. Set aside. Using a clean electric whisk, beat the egg whites for 1½ minutes until foamy, then add the cream of tartar and keep whisking until stiff peaks form and the mixture has increased fourfold - takes about 2 minutes. Using a metal tablespoon, very gently fold the egg whites into the lemon curd cream in roughly 3 parts, making sure that you don’t deflate the meringue and it’s evenly incorporated. 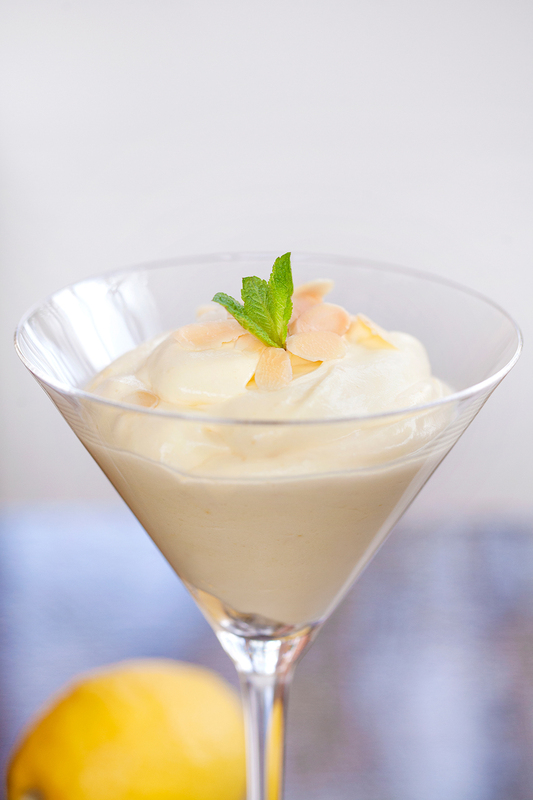 Spoon the lemon mousse into 4 individual dessert bowls or glasses. Chill for 2 hours or until ready to serve. Meanwhile, toast the flaked almonds in a small, dry, frying pan until lightly golden, turning occasionally to make sure they don’t scorch. Watch carefully and take off the heat as soon as they’re toasted, then allow to cool down completely before using. Immediately before serving, sprinkle the toasted almond flakes on top of the mousse. I’m still a bit dubious about using excessive amounts of sugar alcohols as sugar alternative sweeteners in Primal Plate recipes so I’ve supplemented erythritol with pure monk fruit powder to get the equivalent intensity of sweetness I wanted, naturally. Don’t be put off by the price of pure monk fruit powder, it’s actually very economical because only the tiniest amount is needed for it to work its magic. Monk fruit powder is 300 times sweeter than cane sugar but not because it contains natural sugars like most other fruits do. Its incredible sweetness is due to the presence of mogrosides, which are powerful antioxidants. Consequently, monk fruit powder is metabolised differently to fructose and glucose by the body and has a negligible effect on blood sugar. Very useful in food and drinks when you’re trying to lose weight. Because I’ve not used gelatine to stabilise this mousse, you need to make Sugar-Free Fresh Lemon Mousse on the day you intend to eat it. If it’s left in the refrigerator to chill for more than a couple of hours or so, it may start to separate. Not a culinary disaster, just not quite so visually appealing! In a society that tends to eat a lot of excess sugar and overeat in general, it seems that for the most part I stand alone when it comes to refusing to eat or drink anything with refined sugar added. It’s not easy. Not because I crave sugar - physically and psychologically I have come to loathe the stuff - but because relatively healthy sugar substitutes are not readily available and when I can get hold of them, they’re expensive. Whilst buying low-carb sugar replacements to bake with is nothing like the financial liability of regularly eating out - which I seldom do because the majority of restaurant food centres around refined, non-organic vegetable/seed oils, sugar and grains - they come at a price that make your eyes water! Furthermore, most alternative sweeteners either don’t taste quite right or don’t behave like ordinary sugar when you cook with them. Amazingly, I recently found one that’s a notable exception: NuNaturels Tagatose is a prebiotic sweetener produced from lactose that is virtually indistinguishable from table sugar in every respect. Tagatose is costly and even more annoyingly, only currently available to purchase from the US. But with half the calories of sugar and a low glycemic index (GI) of just 3 (sucrose has a GI of 65), it doesn’t raise blood glucose and insulin levels in healthy individuals and those with diabetes type-2. It is also believed to stimulate the growth of beneficial intestinal bacteria. All of this seems to make it a ‘goer’ as a low-carb, Primal sweetener. It was my discovery of tagatose that first enabled me to successfully make low-carb meringues that looked and tasted like the real deal. To the best of my knowledge, they were a culinary ‘first’ and, if you’re willing to believe what the producers of tagatose tell you, they smash conventional meringues made with sucrose into the ground. That said, tagatose became irrelevant for the purpose of this blog post because the next time I tried to order some, there was none left in stock. Disappointed but not dissuaded, I decided the way forward was to purchase NKD Living’s Non-GMO Erythritol sugar replacement sweetener instead. I’d previously seen other peoples’ erythritol meringue recipes posted online but to be honest, it was the pictures of these that originally put me off using erythritol myself. However, beggars can’t be choosers and as I had already challenged myself to feature Zero Sugar Meringues on Primal Plate’s blog, last week I put erythritol to the test. As you can see, the revised version of Zero Sugar Meringues also turned out spectacularly well. Sweet, light and ‘sugary’, erythritol has no aftertaste but does have a slight cooling effect in the mouth. I thought this rather enhanced the eating sensation, which was a bit like biting into an exploding snowball! Crispy on the outside and meltingly soft in the middle, these crunchy, cloud-like patisseries are a luxurious, hedonistic affair when sandwiched together with lashings of whipped cream and accompanied by fresh, organic raspberries to cut through their sweetness. Never mind the price of tagatose, I’m now on a roll with erythritol. Next up, pavlova! Because it takes at least 10 minutes of non-stop beating of the egg whites, meringue is best made in a food mixer with whisk attachment. I’ve included the speeds I set my Kenwood Chef at. Otherwise, use a hand-held electric whisk, or if you’re feeling really energetic, a balloon whisk. Cut a piece of non-stick baking parchment to fit a large baking sheet. Using a scrupulously clean glass or stainless steel bowl and whisk, beat the egg whites on medium speed (Kenwood Chef number 4) until foamy - takes about 2 minutes. Add the cream of tartar and continue beating at the same speed for another 3 minutes. With the beater still running, slowly add the erythritol/tagatose, 1 dessertspoon at a time. When all the sweetener has been incoporated, turn the beaters up a notch (Kenwood Chef number 5) and beat for a further 5 minutes until very stiff and glossy. Add the vanilla extract, if using and beat 1 minute more. Remove the bowl and whisk from the mixer stand. Using the meringue left on the whisk attachment, place 4 blobs of meringue at each corner of the baking sheet so that the paper will stay put whilst you’re spooning the meringue on to it. Bang the whisk attachment sharply against the side of the bowl to remove the rest of the meringue then using 2 metal tablespoons shape the meringue into 8 ovals or mounds on the parchment paper. Bake in the centre of the pre-heated oven for 10 minutes. After the first 10 minutes, lower the temperature of the oven to 110℃ and continue baking for a further 20 minutes. After baking for 30 minutes, lower the temperature again to 100℃ and continue baking for another 30 minutes. Check their progress after 1 hour. Take the baking tray out of the oven and with a flat palette knife attempt to gently lever the meringues off the parchment paper. The meringues are ready when they are dry and crisp on the outside, are a pale coffee colour and will peel off the parchment paper easily. If the meringues are still a little sticky, turn them upside down so that the sticky underside is exposed and bake for a further 10-15 minutes until completely dried out. Now, leaving the meringues in the oven, turn the oven off and allow them to dry out and cool down completely as the oven cools. N.B. This can take a couple of hours or more with the oven door closed, so make sure you don’t need to use the oven for anything else. When the meringues are cooled, they will have a crispy shell and they should sound hollow when you tap the bottom. Store in an airtight container. They will keep for 5 days at room temperature. Do not refrigerate. 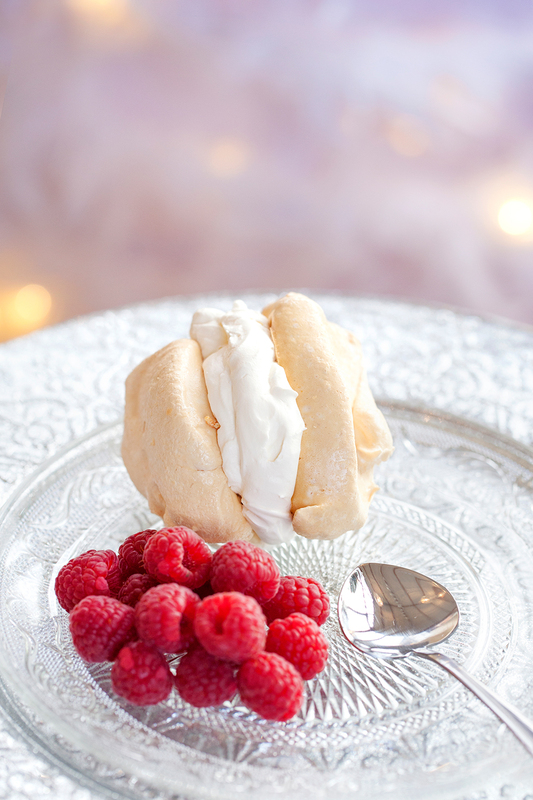 When you’re ready to assemble the meringues, generously sandwich two of them together with lightly whipped cream and serve with fresh, organic raspberries. The bigger the meringues, the longer they will take to bake. Reduce the cooking time if you’re making mini meringue ‘kisses’. A word of caution: Primal Plate does not advise eating any sweetener in high amounts and cannot wholeheartedly recommend any non-nutritive sugar replacements. Whilst non-GMO erythritol and tagatose are thought to pass through the body untouched with virtually zero effect on metabolism/blood glucose levels that doesn’t mean, as is touted by their manufacturers, that they’re natural or healthy. Nevertheless, I do believe that sweet tasting foods are for most people a highly desirable part of their diet, which is why I cautiously promote non GMO erythritol and stevia as possibly the best “naturally occurring” sugar alternatives for low-carb baking. Pure monk fruit powder is probably better if the recipe allows. Unfortunately, monk fruit powder is a 300x sweeter-than-sugar, mustard coloured powder that cannot easily be incorporated into many desserts. If you’re not doing keto and can take the carb ‘hit’, modest amounts of raw organic honey, maple syrup, ripe bananas, homemade apple sauce or medjool dates are also healthier alternatives to table sugar. Whatever sweetener you choose, learn to cut down on the level of sweetness needed. I strongly advise you to try and dampen down your sweet-tooth by saving Zero Sugar Meringues and other Primal Plate sweet tasting treats for special occasions only. It’s pancake day today, but because it’s taken five attempts to make this recipe foolproof, I’m afraid only we will be able to indulge ourselves with these Lemon ‘Sugar’ Keto Pancakes. Never mind that I missed the deadline this Shrove Tuesday. In one form or another, we’ve eaten these pancakes on six successive days during the past week and we’re not bored of them yet! They’re delicious! Two years ago I posted a recipe for Primal Pancakes but my understanding of eating low-carb has moved on significantly since then and, in retrospect, 10 grams of carbohydrate per pancake is quite possibly 9 grams too many, especially when you’re trying to lose weight. Personally, we’re no longer in that boat but a low-carb, high-fat (LCHF) diet still holds good for us because we want to stay at our fighting weight and keep ourselves as healthy as possible. Talking of boats, did you hear about the four British amateur oarsmen who recently smashed the transatlantic rowing race world record by a full 5 days? Get this, they did it by rowing for just under 30 days on fat. That is to say, eating a LCHF aka ketogenic diet. Furthermore, their boat was a sugar-free zone! Admittedly, after 30 days of extreme exertion they binged-out on carbohydrates, but this can hardly apply to Joe Public, who generally don’t stop eating from the minute they get up in the morning to the minute they go to bed at night, and who do little in the way of exercise in between. In my view, the only excuse for not adopting a LCHF diet is that life loses its sparkle if you’re deprived of bread, cake, ice cream, crisps and pancakes. Enter, Primal Plate food blog. It’s my job to fool you into believing you’re not eating low-carb. These delicious pancakes are the perfect example. Neither an American pancake nor a French crêpe, they sit somewhere between the two. We had a couple of hilarious days whilst I fathomed out how to create a pancake batter that would ‘flip’ without drama. Apart from sheer tenacity and persistence, I don’t quite know how I finally achieved such a well-behaved batter that is neither too ‘eggy’, too thick or ‘blubbery’ and is a breeze to turn. It’s a mystery to me what alchemy occurs with even the slightest adjustment to a recipe’s ingredients, but here I give to you - drum roll please - my recipe for flourless, sugarless, Lemon ‘Sugar’ keto Pancakes. It’s now your turn to indulge yourself. I think you’ll find these pancakes are everything you dream of when you think of classic, hot, golden pancakes with the crunch of sugar and the sweet tart lift of lemon juice. When Sarah was a baby, she used to entertain herself by sucking on lemon wedges and chuckling uncontrollably at my screwed up face as I imagined their sour taste assaulting her senses. Your little ones may appreciate freshly juiced blood oranges in place of lemon juice and organic maple syrup or raw honey instead of erythritol. These pancakes are equally yummy served with fresh organic blueberries and lightly whipped cream. An easy to follow recipe that should have you enjoying pancakes all year round. In a bowl, mix the cream cheese and crème fraîche together with a fork until soft and smooth. Beat the eggs and egg whites with electric mixer or hand held blender on high for 1 minute to make them light and fluffy. Add the softened cheese mixture to the eggs and blend for 20 seconds more before adding the rest of the ingredients and blending again until well combined. Let the batter stand for 3-4 minutes. While the batter is standing, heat a small (20 cm) non-stick frying pan - I use this one - over a medium heat. When hot, add a little butter or oil to the pan - wiping away any excess with paper kitchen roll. Add 2-3 heaped tablespoons of the batter and swirl the pan so it covers the base evenly. Cook for 4-5 minutes until the underside of the pancake is golden and lots of small bubbles appear on the surface. Turn the pancake over with the aid of a flexible, wide slotted turning spatula. Fry on the second side of the pancake for a further 2-3 minutes until golden and set. Slide the cooked pancake onto a warm plate, sprinkle over the erythritol sweetener and agree to eat in relays. Alternatively, roll each ‘sugared’ pancake tightly into a cigar shaped cylinder then cover and keep warm in a low oven whilst you cook the rest. Delicious, organic Citron Beldi lemons available from Abel & Cole are sweet, floral citrus fruits that look like squashed lemons and come all the way from Marrakech. They are only around in winter, so make the most of them while you can. They make a delicious juice to serve with these pancakes. NuNaturels tagatose was going to be my closest-to-sugar alternative for sprinkling over these pancakes but it’s a nightmare to get hold of and ridiculously expensive to boot, especially when you add on custom charges. I’ve just had to pay an additional £17 to get three 250g bags of tagatose into the U.K. So until someone somewhere pulls their finger out and starts to produce pure tagatose for sale in the U.K., I have decided to abandon the idea of promoting Primal Plate recipes that rely on tagatose as a primary ingredient. Very disappointing, since before last Christmas I’d perfected a brilliant sugar-free meringue recipe that I never had chance to post. Identical to normal, crispy on the outside and slight chewy on the inside meringues, I thought they would be a lovely recipe to feature for Valentines Day. Unfortunately, without it, I’m going to have to start over. For now, that just leaves me with non-GMO erythritol to play with. Erythritol is naturally found in fruits, vegetables and fermented foods. It has a GI of 0 and 0.2 calories per gram. It does not affect blood sugar and is suitable for a low-carb diet. Its sweetness is about 70% of table sugar, so you may need to use a bit more than sugar. Don’t worry, erythritol counts as a zero carb sweetener because your body can’t digest it.